CCR are pleased to announce that their talented officials crew will be well represented at this year’s WFTDA sanctioned European tournament 2013: A Skate Odyssey in Gent, Belgium. Rolling Rat, Metal Ed, and Major Travis T will all be present with whistles at the ready showcasing their highly prized refereeing skills. 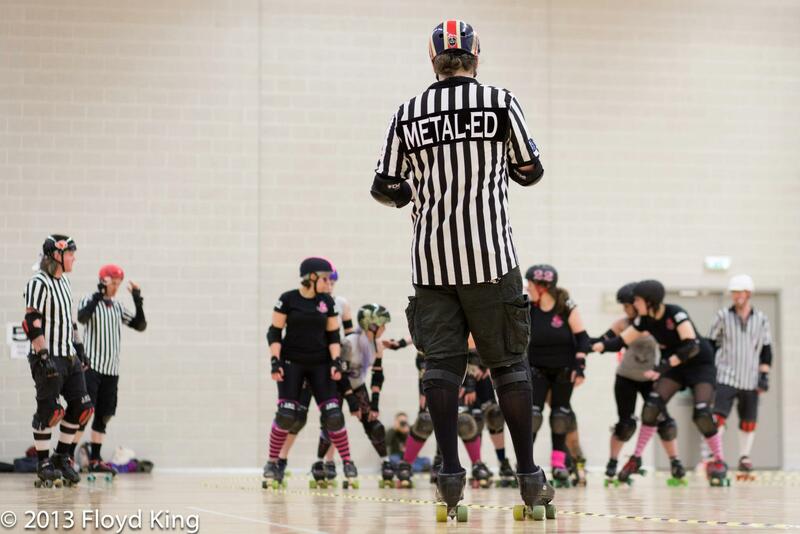 This season has been an exciting one for our officials crew with both Metal Ed and Major Travis T graduating from last year’s WFTDA certification programme and Rolling Rat stepping up to become Head Referee. Our refs have been kept very busy not only with CCR’s bouting schedule, but officiating across mainland Europe including running official’s boot camps and representing across the UK at high level fixtures including numerous men’s bouts. We are very proud of our officials here at CCR. Their dedication and hard work to raise the bar of officiating across the UK continues to see them kept in high demand!